Turkish Prime Minister Ahmet Davutoglu's official visit to Azerbaijan on December 3-4 which came as the first in this capacity to a foreign country has had several important messages for both countries and the region as well. The first of them was a focus on the strong the relations between Azerbaijan and Turkey. Azerbaijan-Turkey enjoyed strong relations for centuries due to a common culture and history and the mutual intelligibility of the Turkish and Azerbaijani languages. Turkey was the first country in the world to recognize Azerbaijan's independence in 1991 and has been a staunch supporter of Azerbaijan in its efforts to preserve its territorial integrity and realize the economic potential that arises from its rich natural resources in the Caspian Sea. "Turkey and Azerbaijan are very close to each other. We support and will continue to support each other," Azerbaijani President Ilham Aliyev said in an expanded meeting with Davutoglu. The second main message was related to Turkey's support to Azerbaijan in settlement of the Armenia-Azerbaijan Nagorno-Karabakh conflict. President Aliyev once again thanked the Turkish people and government for supporting Azerbaijan's position in resolving the Armenian-Azerbaijani Nagorno-Karabakh conflict. The Nagorno-Karabakh conflict emerged in 1988 over Armenia's territorial claims against Azerbaijan. More than 20,000 Azerbaijanis were killed as a result of large-scale hostilities and over one million Azerbaijanis are unable to return to their homes because of the invasion. Armenia continues the occupation of Azerbaijani territories, which in turn obstacles the regional security and peace. Davutoglu, in turn, reiterated Ankara's support to every step which will be taken towards the liberation of the occupied Azerbaijani territories, and ensuring a fair and sustainable world. "Turkey's position in this issue is open and concrete. Turkey will continue to support Azerbaijan as long as all the occupied Azerbaijani lands - every single square centimeter - are not returned back," Davutoglu said at a joint press conference. "The main principle in the settlement of many problems in the world is a mutual respect for territorial integrity. Ensuring peace and stability has been quite difficult in the Caucasus when 20 percent of Azerbaijani lands are under occupation, he added. The third message of Davutoglu was related with economic relations of the two countries, in particular in the energy and transport sector. Azerbaijan and Turkey enjoy good and developing economic ties, especially in terms of huge energy projects envisaging the transportation of Azerbaijan's hydrocarbon resources to the European and world markets through the Turkish territory. "The Turkish-Azerbaijani cooperation lies on the basis of the largest projects of the Eurasian continent. Energy and transport projects are of significant importance in this regard. The TANAP project started to be implemented after several projects, such as Nabucco, became an impossible dream, and it was possible thanks to the friendship and mutual trust between Turkey and Azerbaijan," Davutoglu said. President Aliyev and Premier Davutoglu believe that the TANAP project will be implemented earlier than the schedule for 2018. "We will do our best and work day and night to do everything needed within the borders of the Turkish Republic for the implementation of the TANAP project. Similarly, this work will be carried out in Azerbaijan as well, as TANAP and Baku-Tbilisi-Ceyhan, the two major projects for supply of oil and natural gas from the Caspian Sea to the Mediterranean Sea and Europe," Davutoglu noted. He believes that the delivery of the hydrocarbon resources of the Caspian region is one of the main options for Europe's energy security. "I also informed President Aliyev about the Turkey - European Union summit held last Sunday. We once again discussed with our European friends the issue that if Europe's energy security will be the topic of discussion, the safest route will be the delivery of Caspian [hydrocarbon] resources to Europe via Turkey," he stated. Davutoglu, who considers Baku and Azerbaijan as the rising star of Asia, believes that the Baku-Tbilisi-Kars railway, which is being implemented by Azerbaijan and Turkey jointly with Georgia, is the artery of the modern Silk Road, running from China to Istanbul and Europe. "Since the beginning of functioning of this line in the first half of 2016, the historic Silk Road will gain a new meaning, a more modern form, he noted. "The implementation of the corridor as soon as possible and the establishment of the shortest transport route will turn beautiful Baku into one of the most important ports of Asia." Azerbaijan and Turkey are successfully engaged in mutual investment as well. It is expected that in the coming years, Azerbaijan will invest about $20 billion in Turkey. "Azerbaijan's investments in Petkim in Izmir region of Turkey have given us tremendous power. Our goal is to bring the amount of these investments to $20 billion in a short term, and the current trade turnover worth $5 billion to $15 billion. 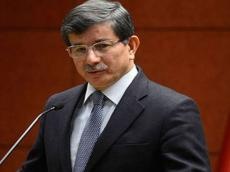 We have a will to carry out the necessary work in this regard," Davutoglu said. He also expressed confidence that peace in the Caucasus and in adjacent regions is largely dependent on the Turkish-Azerbaijani relations. "From this point of view, we attach great importance to the tripartite mechanisms of Turkey - Azerbaijan - Georgia, Turkey - Azerbaijan - Iran, and Turkey - Azerbaijan - Turkmenistan. We are absolutely convinced that the mechanisms in which Turkey and Azerbaijan are presented together and with other countries will contribute to the peace," he added. The main and most important message of Davutoglu's Baku visit was Turkey's calls to Russia on the settlement of the recent tensions between Ankara and Moscow due to Russian SU-24 bomber downed by Turkish F-16 fighter jets. He urged Russia to resolve this crisis by diplomatic means. "Turkey has always pursued a policy of transparency and openness in all these issues. I once again urge our friend, neighbor and large partner - Russia to coolly evaluate all these issues. Turkey protected its borders. Until now, it has never taken an aggressive stance against any country," he said. "In the current situation, Turkey is ready to discuss any question with Russia. We can discuss all questions in detail. Despite the fact that we are in different positions on every issue, we can meet, negotiate, and share our opinions. We are also ready for negotiations at the same table," he added. Touching upon the economic sanctions imposed by Russia against Turkey, Davutoglu said Turkey considers Russia's such a decision as a great contradiction. "We did not join the economic sanctions against Russia in its most difficult times," he said. "A country dissatisfied with the imposition of economic sanctions against it should not impose them against others. In addition, economic sanctions harm both sides. No any economic sanction can act unilaterally." Davutoglu believes that Turkey and Russia should resolve this problem at the same table, "as the Turkish-Russian are important not only for the two countries - Turkey and Russia, but also for the Caucasus, the Balkans, Central Asia, the Middle East, the Black Sea and Caspian Sea and other regions. The good relations between Turkey and Russia will contribute to the peace and stability in all these regions."